Vital importance of the doctrine—General agreement of the Christian Church in all ages—Danger of Rationalism, and its prevalence in the present age—All error partial truth—Systems of doctrine unavoidable—All controversy upon the subject is to be determined by a simple appeal to Scripture—Objections to the evidence upon which a doctrine rests to be frankly considered, but all rationalistic objections to the plain teachings of inspiration inadmissible—The plan of the following treatise briefly stated. The attitude of God, of the individual sinner, and of the moral universe in relation to the Atonement severally considered—The Orthodox doctrine shown to be comprehensive and consistent, and the Moral Influence and Governmental Hypothesis shown to be partial and inconsistent—The elements of the Orthodox Doctrine stated in respect to its Motive, its Nature, and its Effects. Necessity of technical terms, and need of acurate definitions—ATONEMENT and SATISFACTION—The difference between a penal and a pecuniary satisfaction—Penalty and distinction between CALAMITIES, CHASTISEMENTS and PENAL EVILS—Meaning of the terms SUBSTITUTION and VICARIOUS—EXPIATION and PROPITIATION—IMPETRATION and APPLICATION—REDEMPTION and ATONEMENT—MERITUM and SATISFACTIO, or the distinction between active and passive obedience—The principal points involved in the doctrine stated. The ultimate motives of all God's act ons are in himself proved—The Scriptures predicate holiness of the divine nature as well as of the divine will—They assert that God hates sin, and regards it as intrinsically worthy of punishment—The different answers to the question, Why does God punish sin? considered—The hypothesis that Disinterested Benevolence is the whole of Virtue, disproved—The punishment of sin intrinsically right, and essential to the moral perfection of God—JUSTICE voluntary, but not optional—GRACE necessarily a matter of sovereign choice. The divine law shown to be immutable—Dr. Fiske's admissions—The law ceremonial and moral—The Penalty shown to be an essential part of law—The admissions and inconsistencies of Fiske and Barnes—The sufferings of Christ shown not to have been a "substitute for the penalty," to have been not identical with the sufferings demanded of his people in person, considered as suffering, but precisely identical considered as penalty—Scripture teaches that Christ came with the design of fulfilling, not relaxing the law—The position of Dr. John Young as to the nature of moral law, and its penalty stated and refuted. The distinction between the Natural, Federal and Penal relations which men sustain to the divine law stated and applied. The admitted facts of man's birth into an inevitable condition of sin and misery stated—The Orthodox and the Rationalist agreed that God could not bring the new-born soul into such a condition, unless his natural rights had been justly forfeited before birth—The two questions thence arise, WHY God allows such a curse to be transmitted, and HOW it is transmitted—I. The attempted solutions which deny that man is subject to a just antenatal forfeiture—The Manichæan doctrine of the absolute impreventability of sin—Pantheistic hypothesis that sin is a necessary incident to moral development—The New England Root Theory and Placæus' doctrine—Mediate and Consequent Imputation stated and refuted—II. The attempted solutions which admit antenatal forfeiture—Theory of pre-existence is maintained by Dr. E. Beecher and Julius Müller stated and refuted—The Realistic theory of our oneness with Adam, as advocated by Drs. Baird and Shedd, stated, proved not to have been the doctrine of the men who wrote the Creeds of the Reformed Churches, and not to be true—The Doctrine of President Edwards—The Several points involved in the true doctrine, 1st, As to the imputation of guilt, and 2d, As to the origination of moral corruption in each new-born soul, stated, and the whole proved from Scripture, and the consent of Churches. Heads of argument stated—I. The divine origin of Sacrifices proved—The primitive Sacrifices were piacular—The principle established by the common consent of mankind—II. That the Jewish Sacrifices were strictly piacular, the doctrine of the entire Christian Church—The opinions of Bähr, Maurice, Jowett, Bushnell and Young—The different kinds of Sacrifice—The Orthodox doctrine proved (a) from the occasions upon which the sacrifices were offered, (b) The qualifications and sacrificial designations of the victims, (c) The ritual of the sacrifice, (d) from their declared effects, and (e) from the testimony of the inspired prophets, and of ancient heathens, Jews and Christians—III. The Sacrifices of the law were typical of the sacrifice of Christ—This proved from the words of Christ—from the fact that the Old Testament sacrifices are declared to be shadows, &c., of which Christ is the substance, and from the fact the Scriptures explicitly assert that Christ saves his people by being offered as a sacrifice for them. The position assumed by the advocates of the Moral Theory as to the nature of Christ's Priesthood stated—The same as to the advocates of the Govermental Theory—I. The Priest was ordained to act in behalf of man in those things which bear upon God—That the effect of his work primarily terminates upon God, proved from Scripture—II. The work of the priest secured the salvation, not the salvability, of those for whom he acted, and he acted as the representative of certain persons definitely—III. That Christ was a real and not a metaphorical priest, proved from Scripture—The inferences from these positions deduced. Bushnell's perversion of the phrase Vicarious illustrated and disproved—The true relation of the words, Vicarious, Substitute, Representative and Mediator, stated—Barnes' definition of a substitute accepted as true—That Christ is in the strict sense the Substitute of his people and his sufferings vicarious, proved—Barnes' inconsistency exposed. Passages which assert the fact cited—Different senses of the word "sin" in Scripture—The scriptural usage of the phrase "to impute sin." explained and illustrated and proved—The doctrine guarded from abuse, and the misrepresentations of adversaries rebuked—The usage of the phrase, "bear sin or iniquity," both in the Old and in the New Testament, illustrated and proved—Bushnell's extravagant assertions exposed. I. The effect of Christ's death as it respects God—The classical and New Testament usage of the phrase καταλλάσσειν stated and proved—The classical and New Testament usage of the phrase λάσκεσθαι stated and proved—The Biblical usage of כפר explained—II. The effect of Christ's death as it respects the guilt of sin—The objections of Young answered—The Atonement shown to be the effect and not the cause of God's love for his people—The Orthodox doctrine shown not to involve Tritheism—III. The effect of Christ's death as it respects the sinner himself—The Biblical usage of the terms γαράζειν, λυτρόω, λύτρον explained—This language proved not to imply that the Atonement was a commercial transaction—This usage establishes theOrthodox doctrine—The Scriptures combine various modes of conceiving of the Atonement in the same passages, and thus define the species as well as the genus of the Atonement as definitely as any one of the Creeds. The common objection that vicarious punishment is unjust considered—I. The fact that Christ and his people are one proved from Scripture—The substance of all that is revealed as to the nature of this union stated—II. The fact of this union, as thus proved from Scripture, shown to be consistent only with the Orthodox doctrine of the nature of the Atonement. I. Justification proved to be a forensic act of God as Judge, and thus shown to stand in irreconcilable opposition to the Moral Influence Theory as to the nature of the Atonement—The arguments of Dr. John Young answered—II. The view of Justification corresponding to the Governmental Theory of the Atonement stated—The true doctrine, viz. that Justification is not mere pardon, that it is a Judicial and not a Sovereign act, and that its ground is the perfect righteousness of Christ imputed to the believer, stated and proved. That faith includes trust proved—That faith in or on Christ as the sole condition of salvation is the gospel preached by the Apostles, proved—That this fact is perfectly consistent with the Orthodox view of the Atonement, but utterly irreconcilable with either the Governmental or the Moral Theory, shown. Different opinions as to the ground of the NECESSITY of the Atonement, stated—The bearing of this question upon the question as to the NATURE of the Atonement—The true ground of the necessity of the Atonement stated and proved. I. That the Atonement of Christ is intrinsically perfect in its law-fulfilling and justice-satisfying value—Different views stated and compared— The true doctrine stated and proved—II. That the atoning work of Christ is perfect and complete in the sense of infallibly securing its own application to all of those for whom it was designed—This point proved (a) in opposition to the Romish doctrine of the merit of good works and the efficacy of penance, (b) in opposition to the Protestant advocates of an indefinite Atonement. 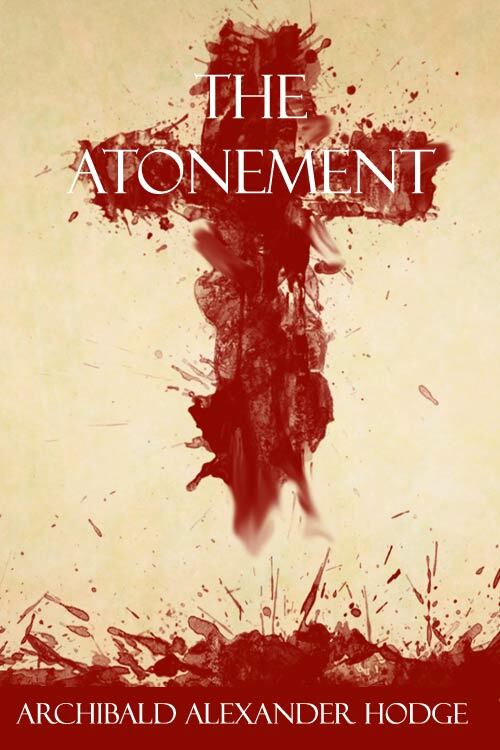 Ambiguity of the word Atonement—The term Satisfaction precise and comprehensive—Defect of Symington's book—That the obedience of Christ is inseparable from his suffering, proved—General object of chapter to prove that Christ's obedience as well as his sufferings is vicarious—Threefold relation mankind sustain to law—Obedience is as absolutely necessary in order to the promise of life as is penal suffering in order to the judicial reconciliation—I. The original covenant was accompanied by two sanctions, a promise conditioned on obedience and a penalty—The two alternative theories of justification stated, and the truth of the Calvinistic view proved—II. The doctrine contended for shown to be expressly stated in Scripture—III. Christ's obedience shown to have been vicarious, from the fact that his person transcended the the claims of law—IV. Only a perfect righteousness can be the ground of justification—V. Tha objection of Piscator, &c., refuted. I. General statement of the points which the historical evidence to be adduced are claimed to prove—II. The historical argument of Dr. Young stated and refuted, and the testimony of writers from the time of the Apostles to the present time adduced, together with citations from the Creeds of the Greek, Roman, Lutheran and Reformed Churches—III. The result of this historical review shown to be that the uniform faith of the entire Church has included the element of expiation, and consequently is inconsistent with either the Moral or the Governmental Theories of the Atonement. 1st. The objection that our doctrine ascribes vindictiveness to God, disproved—Show that both the Moral and the Governmental Theories resolve justice into benevolence—2d. The objection of Socinus and others, that our doctrine excludes grace, disproved—3d. The general principle that the demands of the law are personal shown not to impugn the truth of our system—4th. The objection that Christ was but a single person, and his sufferings finite and of short duration, shown not to have weight—5th. The Church doctrine of "Imputation" shown not to include the absurd figment of the "transfer of moral character"—6th. The objection that Christ owed obedience for himself, disproved. I. The Moral Influence Theory—The object of Christ's death defined by Socinus—Statements to the same effect by Bushnell and Young—The objections to the Moral View are, 1st. The moral influence in question is better effected by the Atonement when conceived of according to the Orthodox view—2d. The Moral Theory fails, as its advocates confess, to account for the production of the moral effect—3d. Inconsistent with true nature and design of a sacrifice—4th. Inconsistent with the application of the work of Christ to those who died before his advent—5th. This doctrine is condemned by its historical record—II. The Governmental Theory—History and statement of the doctrine—Its superiority to Moral Theory—Objections to this theory are, 1st. The positive truth of the Governmental Hypothesis better taught by the Orthodox doctrine—2d. It shows no connection between the death of Christ and its acknowledged effects—3d. It is founded upon a false theory of virtue—4th. It represents the work of Christ as an exhibition of principles not truly in exercise—5th. Inconsistent with true idea of law, sacrifice, vicarious suffering and ransom, &c—6th. It necessitates the conclusion that the Atonement was indefinite—7th. It is connected with the false theory of co-operative justification—8th. Is contradicted by the uniform faith of the Church—9th. It was not developed from Scripture—10th. Its only plausible support is its relation to the figment of an indefinite Atonement—11th. Its known Arminian origin proves its inconsistency with Calvinism. The question as to the design of the Atonement considered as it is involved in our controversy—1st. With the Arminians—2d. With the Calvinistic Universalists. The question stated first negatively and then positively under several heads. The view as to the Design of the Atonement entertained by the advocates of, 1st. The Moral View, 2d. The Governmental Theory, 3d. The strictly Mercantile View, 4th. The view of the Lutheran Churches, 5th. The view of the Reformed Churches and of the Arminians. The use of indefinite language by many strict Calvinists explained—The different senses in which the phrase "That Christ died for all men" has been used—The doctrine of Amyraldus and its reception by the French Synod—The doctrine of the Marrow-men as to the general reference of the Atonement —The two classes of the recent advocates of an indefinite Atonement considered. The true position of Calvin on this subject carefully shown—The standard of Calvinism shown, and proved to admit only the doctrine of a definite Atonement—The doctrine of the Westminster Confession and Catechism demonstrated. This proved—1st. From the very nature of the Atonement, since Christ suffered as the personal Substitute of his people, and his work was a satisfaction, and he died with the design of actually saving those for whom he died—2d. Christ purchased faith and repentance for his people—3d. He died after half the human race were already dead—4th. He died in execution of the terms of an eternal covenant with his Father—5th. His motive was the highest personal love for his own people—6th. His design declared to be the salvation of "his sheep," the "Church," &c.—7th. Christ's work as High Priest was one work, and proved from the doctrine of election—8th. Our doctrine harmonizes all the facts. It is objected that our doctrine is inconsistent—1st. With the general offer of the Gospel; answer—2d. With those passages which declare he suffered for "all," or "the world;" answer—3d. With those passages which speak of the possibility of those dying for whom Christ died; answer.